Click on item #18A in the shopping cart to buy this book. Click on item #18 in the shopping cart to buy this book. Listen to The Space Show interview with Sy. 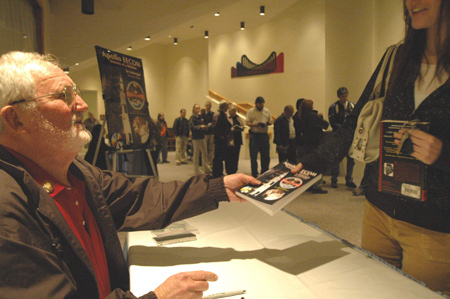 with special Forewords by Ron Howard (Director of "Apollo 13") and Clint Howard who played Sy in the movie. Most of what we learn about NASA's space missions comes from statements carefully planned and massaged by managers and public relations people. With Apollo EECOM: Journey of a Lifetime we finally get an insider's view of how the Flight Controllers operated and just what they faced when events were crucial. 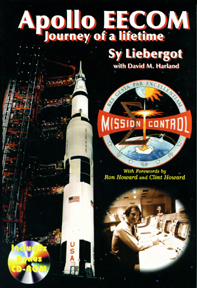 This book is the life story of Sy Liebergot, former NASA Flight Controller, with emphasis on his years working in Mission Control. Following the disastrous tank explosion during the Apollo 13 mission, it was the Flight Controllers that made possible the safe return of the three endangered astronauts. Aboard Apollo 13, Lovell, Haise and Swigert performed wonders battling for their lives, but without the expertise, quick thinking and technical support of Mission Control, they never could have come home. Sy Liebergot was there and relates the details as they really happened. And Apollo 13 is just one of the many exciting stories he tells us. Truly an insider's view, this book discusses not just the events, but also the people that decided and enacted those events. These are the details that were never shown on anyone's TV screen; finally we get to learn what type of people the NASA Mission Controllers really were, and how they handled the demanding tasks that were theirs alone.